Spring might be springing in the lowlands, but we all know that seasons in the mountains are their own thing entirely. 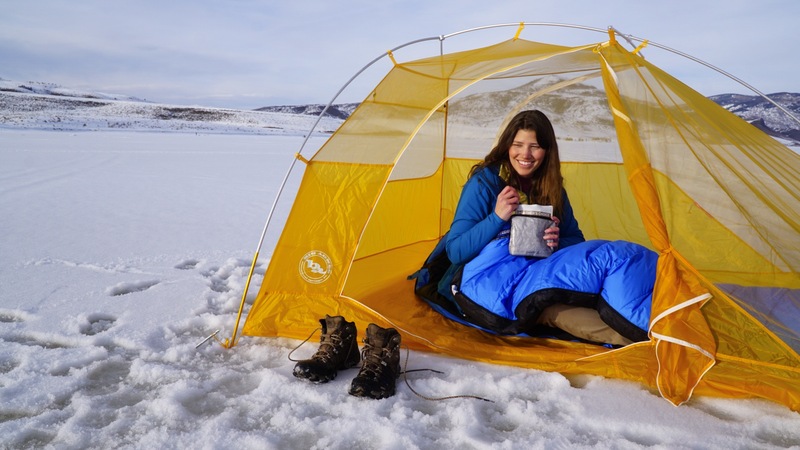 For those who do not mess around when it comes to cold weather warmth and comfort, Feathered Friends offers the Feathered Friends Murre EX 0° women’s sleeping bag. I am a cold sleeper. If I’m sleeping outside on a winter night, you can expect me to be wearing every single piece of clothing I have with me, including my down jacket, and still I will probably be shivering. Needless to say, I have been in the market for a zero degree sleeping bag for a very long time. That is why, when the opportunity to test the Feathered Friends Murre EX 0 in a women’s size medium came up, I jumped at the chance. The Murre is a bag that seems to have been tailor-made for cold weather wusses like me. The no-nonsense design incorporates a robust Pertex outer shell, a thick layer of goose down, and a roomy layout to maximize backcountry comfort in cold conditions. Fortunately, my home currently happens to be 20 minutes south of Steamboat Springs, CO, in a little area known as Stagecoach State Park. 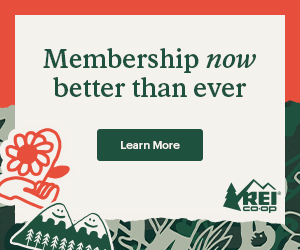 It was a very cold winter here in northwest Colorado, so the first time I slept in it, I actually just stuck to the backyard, reasoning that if I became too cold I could abandon the experiment and retreat to the safety of my (relatively) warm house. The second time I tested it, I backpacked it several miles from home along the trails in the state park (so essentially, I was still in my backyard). Both nights saw temperatures in the single digits, so I got a good idea of how the bag performs at the low end of its temperature rating. Strategic stuffing: Feathered Friends identified key places that affect overall warmth such as the chest area and foot box and filled those areas with extra down. 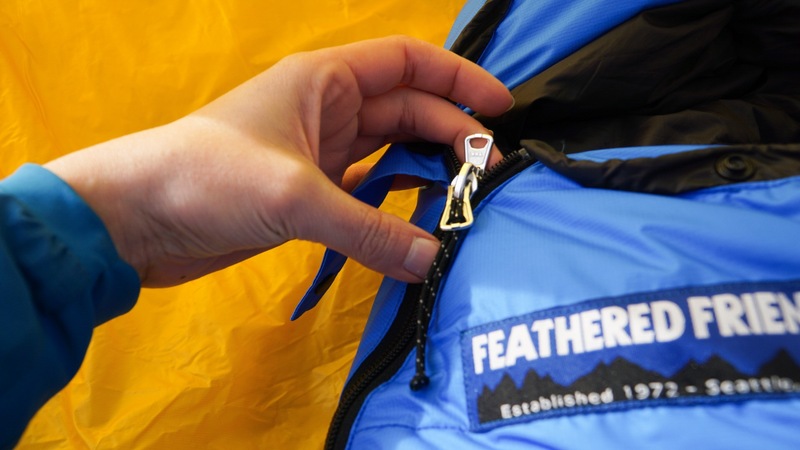 Cinching hood and draft collar: A drawstring allows you to cinch the top part of the sleeping bag in order to trap in as much warmth as possible and stave off drafts of cold air. Waterproof/breathable shell: Utilizes highly waterproof/breathable material Pertex Shield EX for the shell to protect down from moisture. Made in the US: Manufactured in Seattle with imported materials. Double zipper and overstuffed toasty warm hood/collar. I’m a tough critic in this category and I have to tell you, this bag is warm. As mentioned above, I was nervous about sleeping outside in this bag the first time around. I believe the low temperature that night was eight degrees, and unless I am doing an activity that keeps my heart rate and body temperature up, I find it very difficult to be outside at all when it is that cold, let alone sleep. Mind you, I was wearing thick wool socks, fleece leggings, a base layer, a mid layer, a sweatshirt, and a knit hat while I cuddled with the down jacket I had in the sleeping bag with me on standby. But, I did manage to sleep, and I have to give the credit to Feathered Friends. I consider the fact that I didn’t feel the need to put on my down jacket while in the sleeping bag to be nothing short of a miracle, which I attribute at least partially to cinching hood/collar. It really helped keep heat trapped in the bag. Usually when I camp in cold weather I become so tense and shiver so much that I’m kept up all night, but the Feathered Friends Murre Ex 0 absorbed my body heat well and I was eventually able to relax enough to fall asleep. When I tested it again on another night that was likewise in the high single digits, I still found this to be the case. This was the smallest I could make it. There are many benefits to a durable, waterproof outer shell, but the major drawback I noticed was in terms of packability. Simply put, this is not an easy sleeping bag to get into a stuff sack or, for that matter, a backpack. I struggled to shove it all the way into a 15 liter stuff sack and then did my darnedest to compress it down as much as possible. At its smallest it looked like a big awkward burrito, which I then struggled to push down to the bottom of my 45 liter pack. Now I will say that real winter backpacking, especially at high altitudes, requires a lot of extra gear and consequently, a larger pack. Realistically, if you are going on a winter expedition, you are probably going to bring a higher volume pack than the one I used. A 60+ liter pack would accommodate this bag better. Here’s another FF pack we reviewed that compresses to a smaller size. Pertex Shield EX is no joke. It hasn’t rained around here since maybe early November so I tested the water resistance by leaving the bag lying in the snow for a while and by pouring a large cup of water on the outside of it. The worst of what I observed was some superficial wetness on the outside, but for the most part it repelled the moisture remarkably well. The inside shell is comprised of a slightly thinner and less water resistant Pertex 30 denier nylon taffeta that is more capable of getting soaked than the outer layer, but in my experience, the outside of the sleeping bag is where water resistance counts most. I did not go out of my way to try to tear or otherwise destroy this sleeping bag (obviously), but one of my first impressions of this bag straight out of the box was its apparent toughness. The ripstop Pertex Shield outer material looks and feels stronger and thicker than that of any other sleeping bag I have used for backpacking. The stitching is hidden within the baffles, making the threads less vulnerable to pulling and reducing the chance that feathers will start working their way out of them. Finally, the anti-snag double zipper does as well as any I’ve seen at not catching inside of the bag, which I think would contribute to a long life for the zipper. I fully expect this bag to have a long life. This sleeping bag has a lot going for it. It is tough, water resistant, roomy, and remarkably light for a zero-degree bag, especially one with such a hearty shell. And above all, the thing lives up to its promise that it will keep you warm at low temperatures, which is, in my opinion, the most important feature of all. As I mentioned before, the Feathered Friends Murre Ex 0 occupies quite a large portion of your backpack’s real estate. While it is not heavy, volume can matter almost as much as weight, and this bag was consuming a large amount of my 45-liter pack’s space. 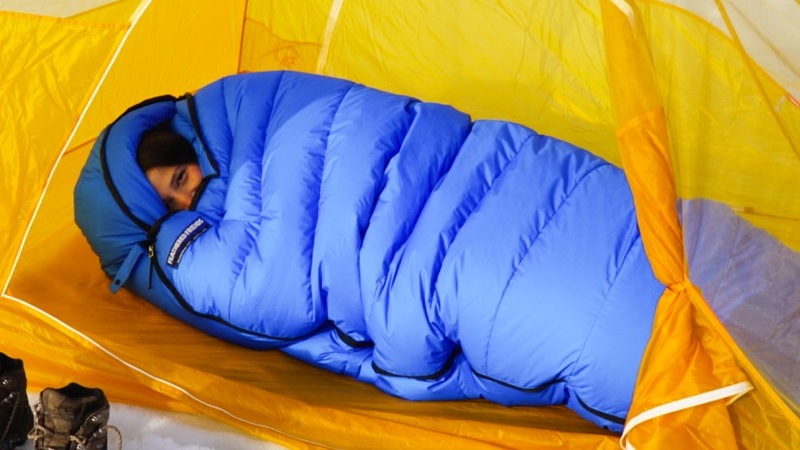 Additionally, at $579, this sleeping bag is certainly not cheap. 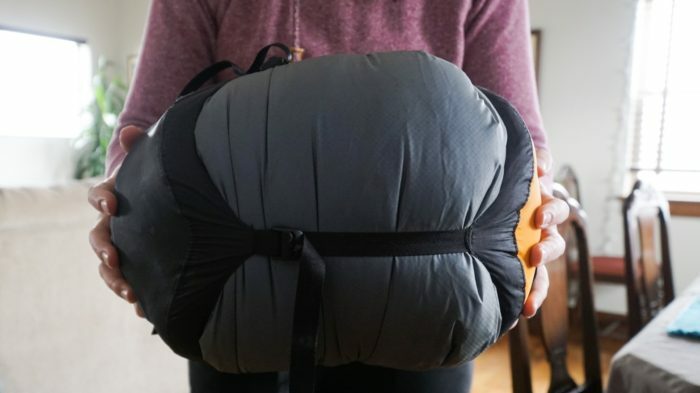 Zero-degree sleeping bags rarely are, but the price point of this bag is still at the high end of the market, so it’s probably not an investment you will want to make lightly. 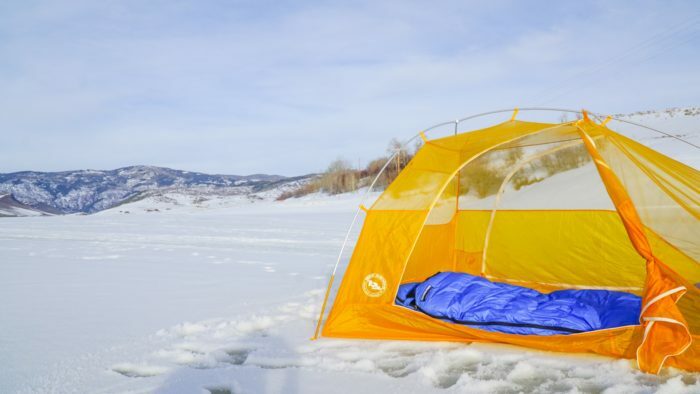 Generally speaking, you get what you pay for with sleeping bags, and this is no exception. At the end of the day, I feel that your decision on whether to purchase this bag ought to come down to the kind of camping you want to use it for. 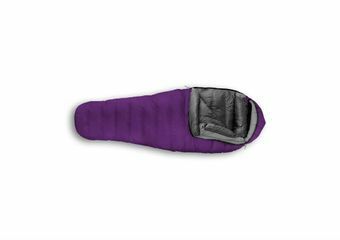 If you’re going on the kind of trips that call for crampons, ice axe, snowshoes, and skills that are a step or two beyond those possessed by your average fair weather weekend warrior, you’ll be pleased with this sleeping bag. Its durability, water resistance, and warmth are features that you can count on, and you can’t beat the warmth to weight ratio for a zero-degree mummy bag. However, if you are planning to use it, say, on a three-season thru-hike, I would probably recommend something more packable. The durability would suit a thru-hike, but I think many would be frustrated that it takes up so much space. A zero-degree bag is likely also overkill for most thru-hikes. Overall this is a great piece of gear that will definitely keep you warm in situations where you expect to see temperatures dip into single digits.